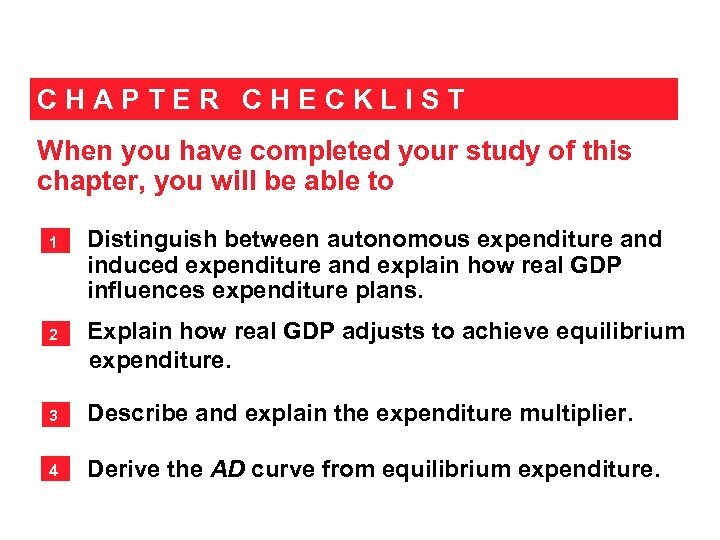 CHAPTER CHECKLIST When you have completed your study of this chapter, you will be able to 1 2 Distinguish between autonomous expenditure and induced expenditure and explain how real GDP influences expenditure plans. 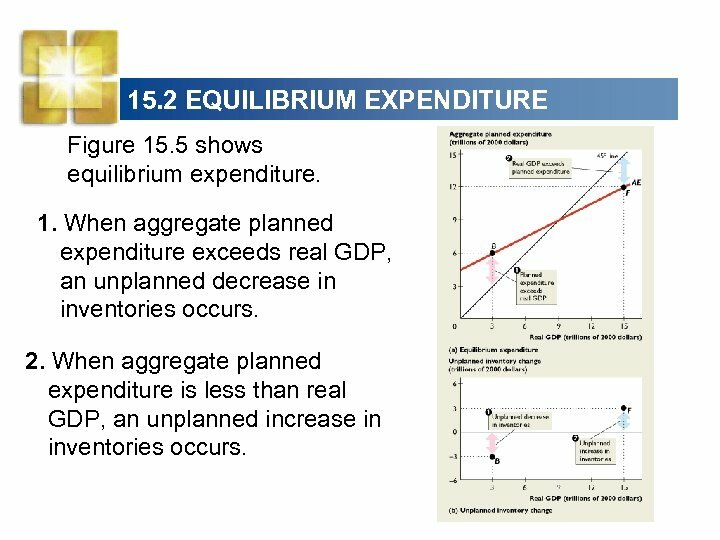 Explain how real GDP adjusts to achieve equilibrium expenditure. 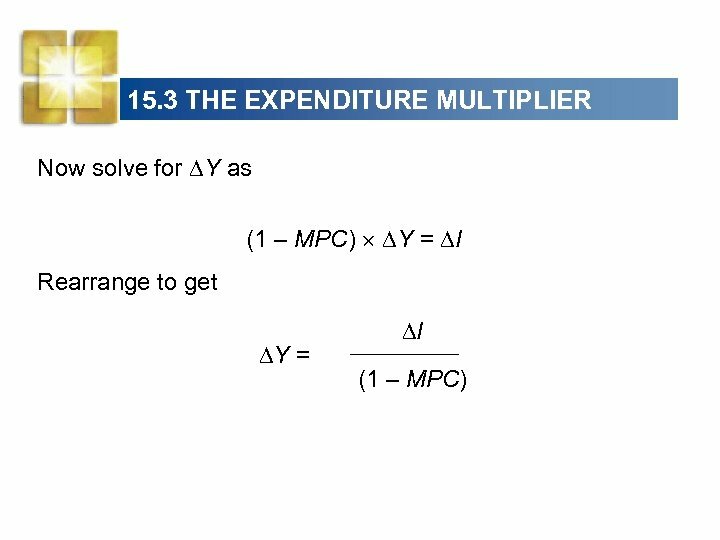 3 Describe and explain the expenditure multiplier. 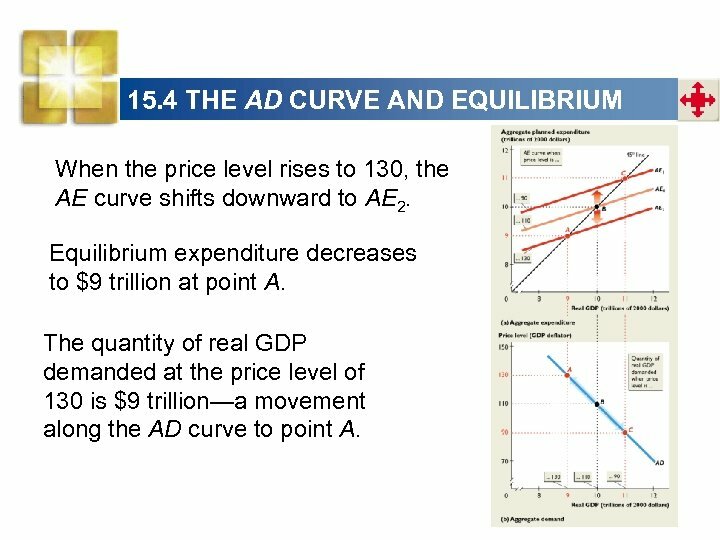 4 Derive the AD curve from equilibrium expenditure. 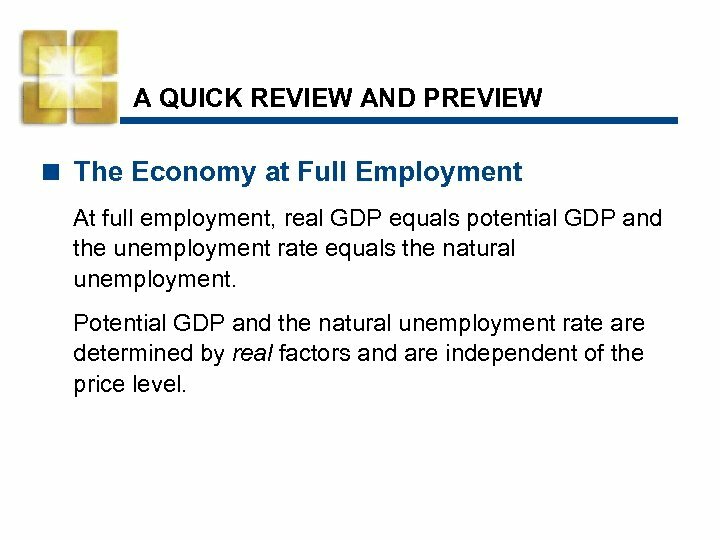 A QUICK REVIEW AND PREVIEW < The Economy at Full Employment At full employment, real GDP equals potential GDP and the unemployment rate equals the natural unemployment. Potential GDP and the natural unemployment rate are determined by real factors and are independent of the price level. 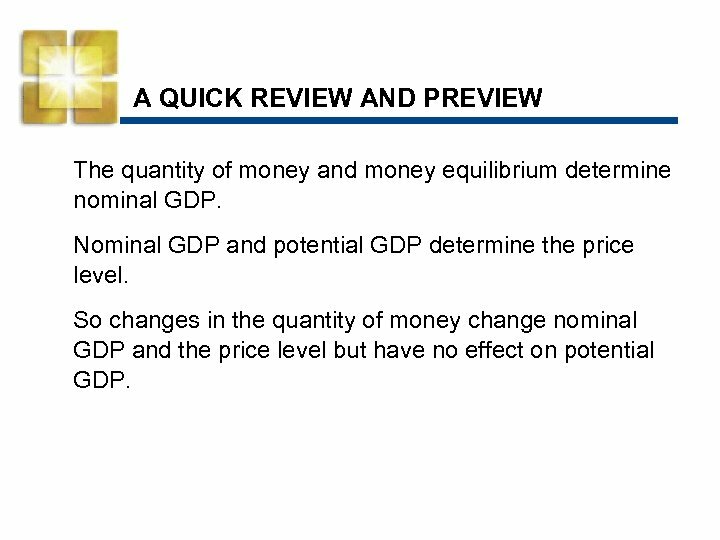 A QUICK REVIEW AND PREVIEW The quantity of money and money equilibrium determine nominal GDP. 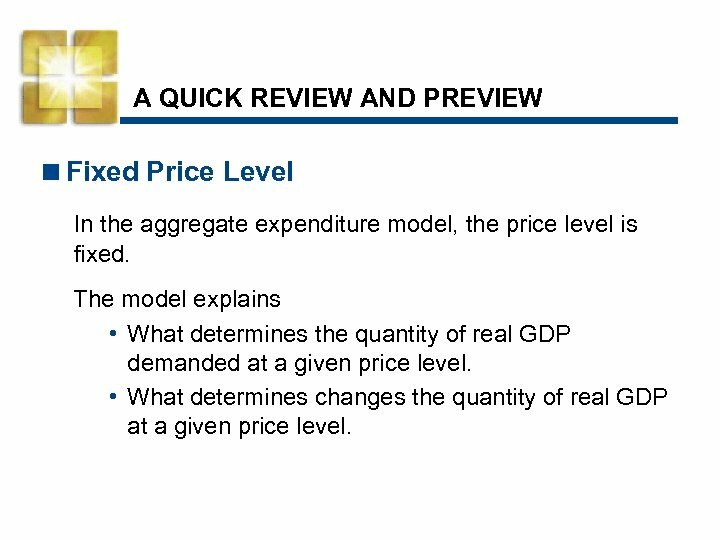 Nominal GDP and potential GDP determine the price level. So changes in the quantity of money change nominal GDP and the price level but have no effect on potential GDP. 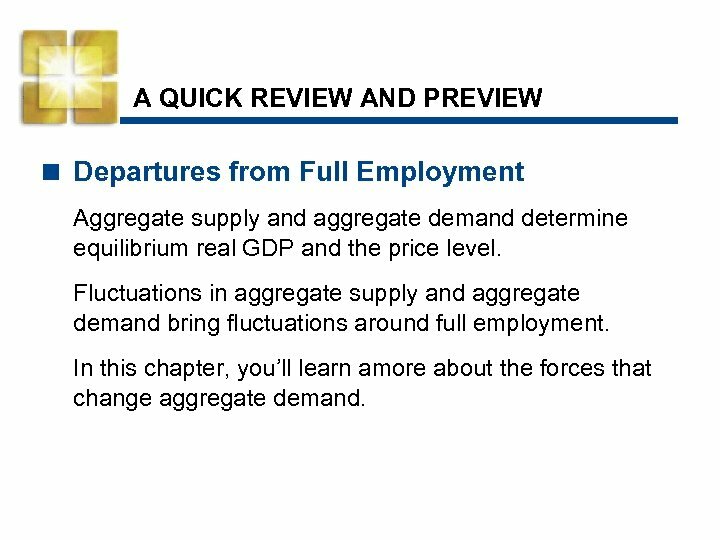 A QUICK REVIEW AND PREVIEW < Departures from Full Employment Aggregate supply and aggregate demand determine equilibrium real GDP and the price level. Fluctuations in aggregate supply and aggregate demand bring fluctuations around full employment. In this chapter, you’ll learn amore about the forces that change aggregate demand. 15. 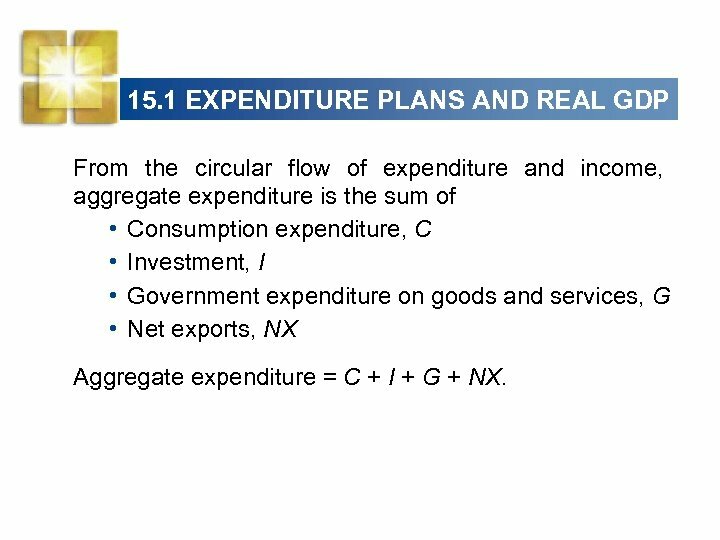 1 EXPENDITURE PLANS AND REAL GDP From the circular flow of expenditure and income, aggregate expenditure is the sum of • Consumption expenditure, C • Investment, I • Government expenditure on goods and services, G • Net exports, NX Aggregate expenditure = C + I + G + NX. 15. 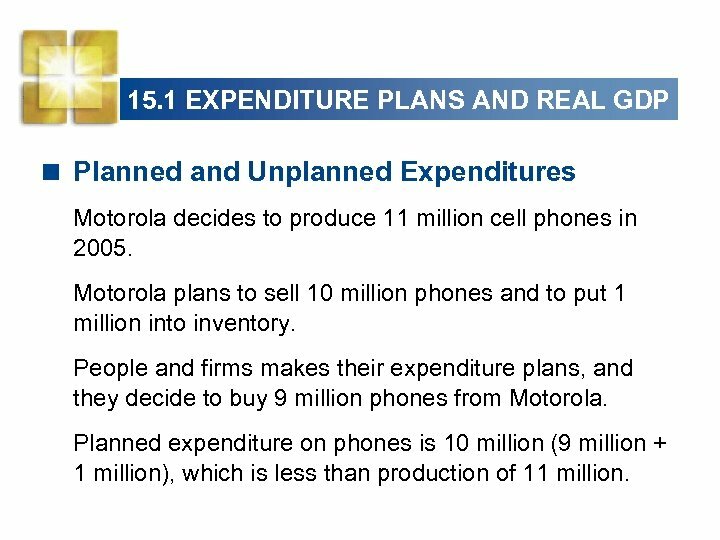 1 EXPENDITURE PLANS AND REAL GDP < Planned and Unplanned Expenditures Motorola decides to produce 11 million cell phones in 2005. Motorola plans to sell 10 million phones and to put 1 million into inventory. People and firms makes their expenditure plans, and they decide to buy 9 million phones from Motorola. Planned expenditure on phones is 10 million (9 million + 1 million), which is less than production of 11 million. 15. 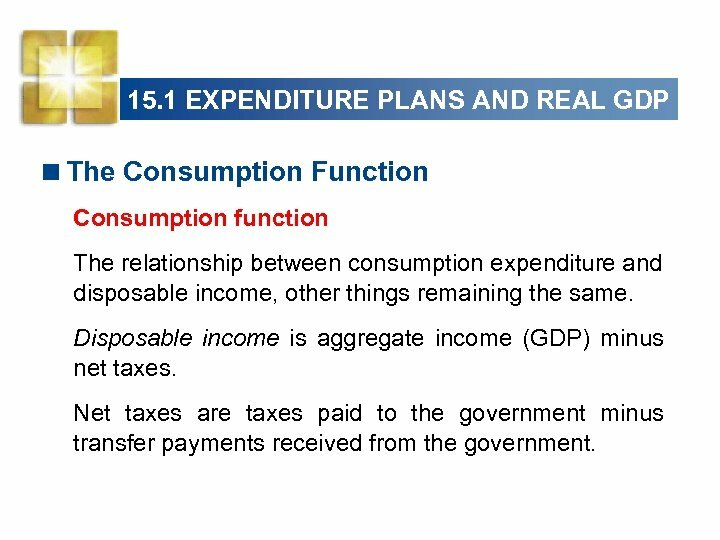 1 EXPENDITURE PLANS AND REAL GDP Aggregate expenditure equals aggregate income and real GDP. 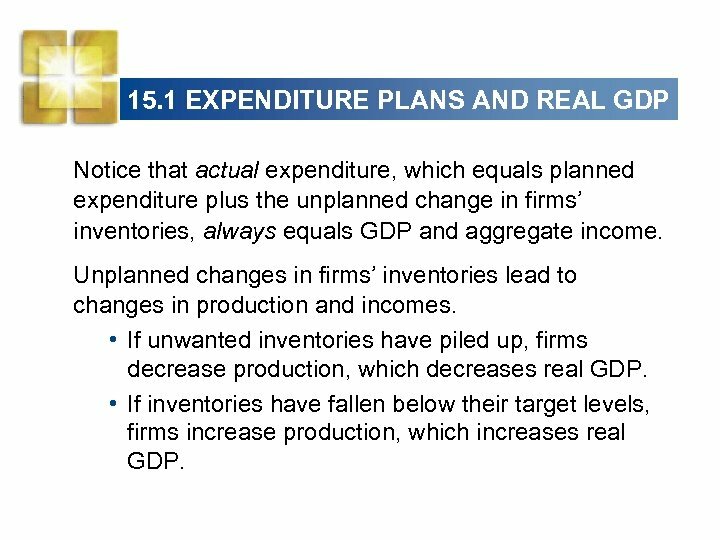 But aggregate planned expenditure might not equal real GDP because firms might end up with up more or less inventories than planned. 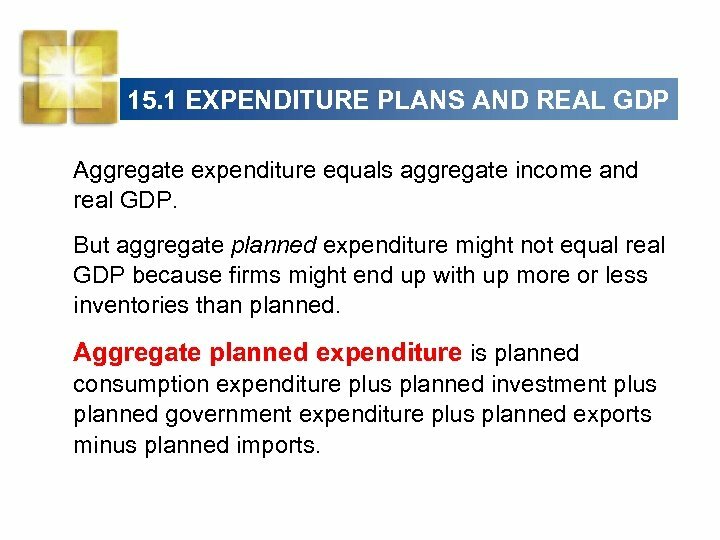 Aggregate planned expenditure is planned consumption expenditure plus planned investment plus planned government expenditure plus planned exports minus planned imports. 15. 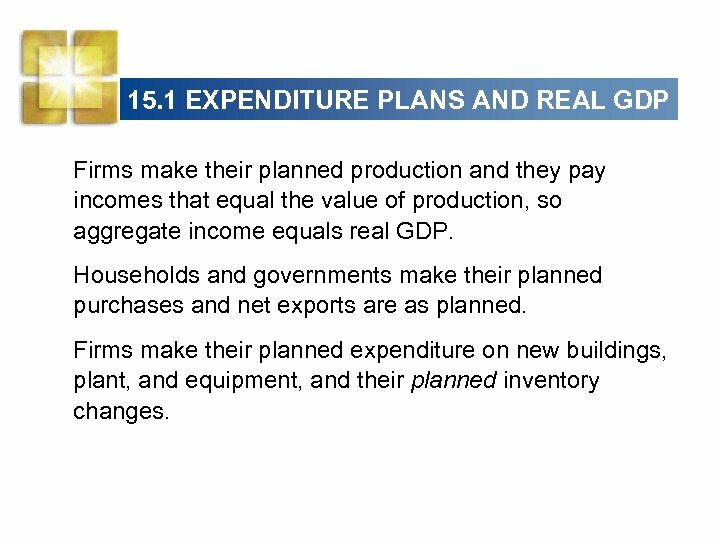 1 EXPENDITURE PLANS AND REAL GDP Firms make their planned production and they pay incomes that equal the value of production, so aggregate income equals real GDP. Households and governments make their planned purchases and net exports are as planned. Firms make their planned expenditure on new buildings, plant, and equipment, and their planned inventory changes. 15. 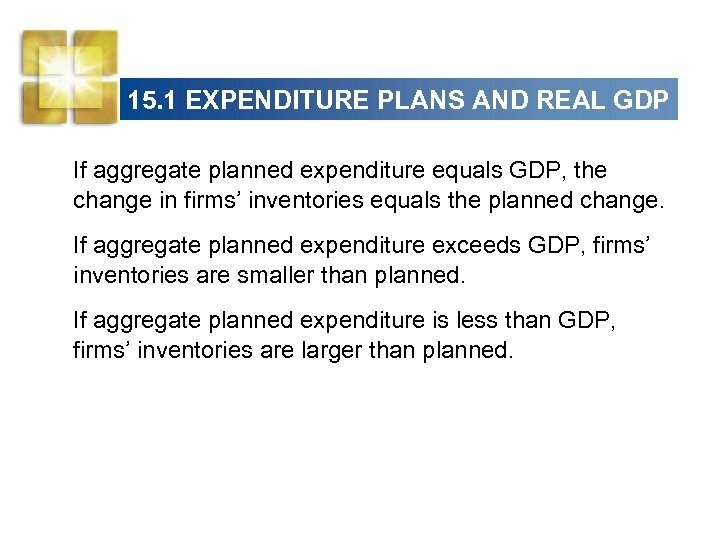 1 EXPENDITURE PLANS AND REAL GDP If aggregate planned expenditure equals GDP, the change in firms’ inventories equals the planned change. If aggregate planned expenditure exceeds GDP, firms’ inventories are smaller than planned. If aggregate planned expenditure is less than GDP, firms’ inventories are larger than planned. 15. 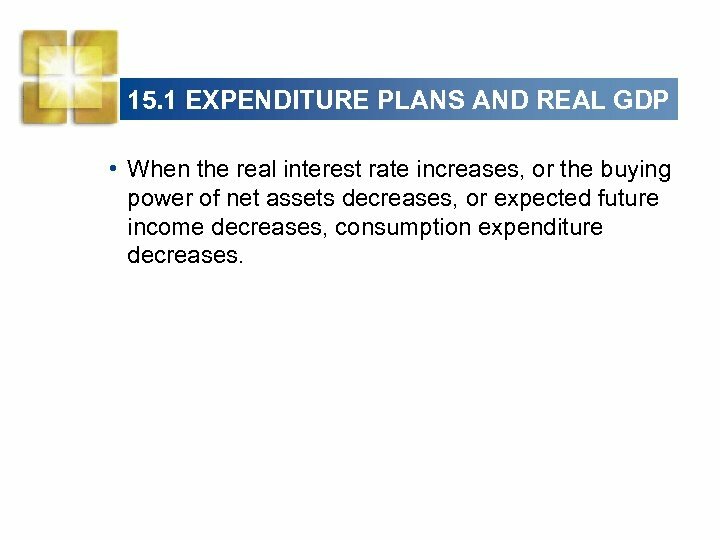 1 EXPENDITURE PLANS AND REAL GDP Notice that actual expenditure, which equals planned expenditure plus the unplanned change in firms’ inventories, always equals GDP and aggregate income. Unplanned changes in firms’ inventories lead to changes in production and incomes. • If unwanted inventories have piled up, firms decrease production, which decreases real GDP. • If inventories have fallen below their target levels, firms increase production, which increases real GDP. 15. 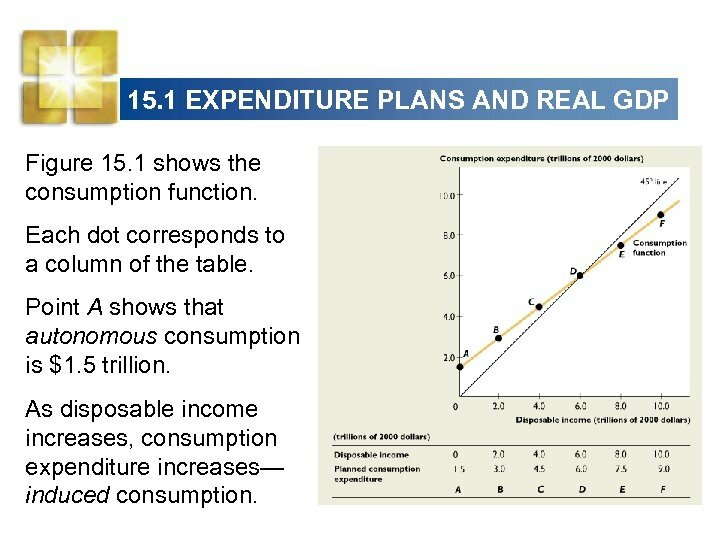 1 EXPENDITURE PLANS AND REAL GDP Induced expenditure The components of aggregate expenditure that change when real GDP changes. 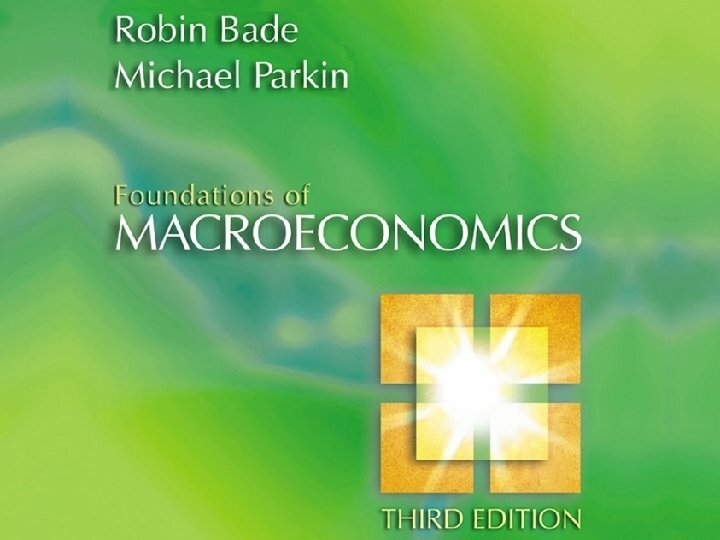 Induced expenditure equals consumption expenditure minus imports (excluding the elements of consumption expenditure and imports that are part of autonomous expenditure). 15. 1 EXPENDITURE PLANS AND REAL GDP Figure 15. 1 shows the consumption function. Each dot corresponds to a column of the table. Point A shows that autonomous consumption is $1. 5 trillion. 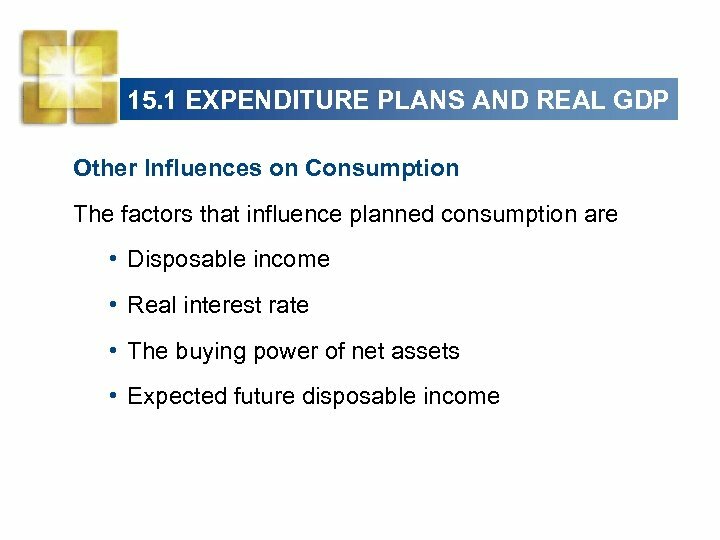 As disposable income increases, consumption expenditure increases— induced consumption. 15. 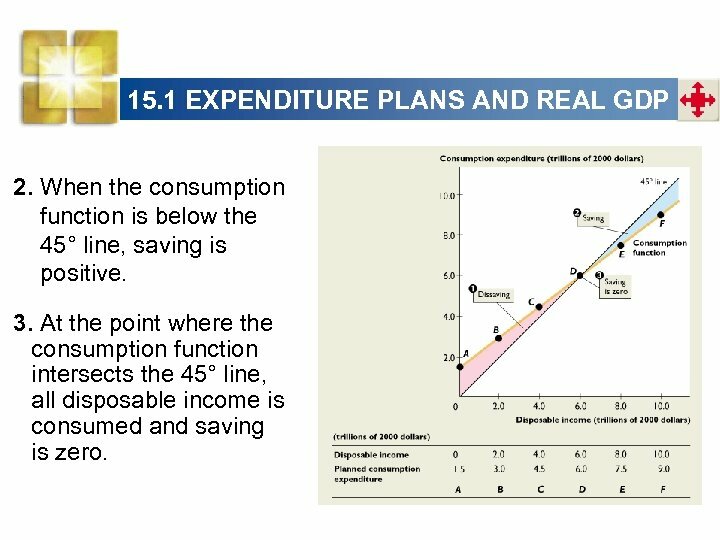 1 EXPENDITURE PLANS AND REAL GDP Along the 45° line, consumption expenditure equals disposable income. 1. 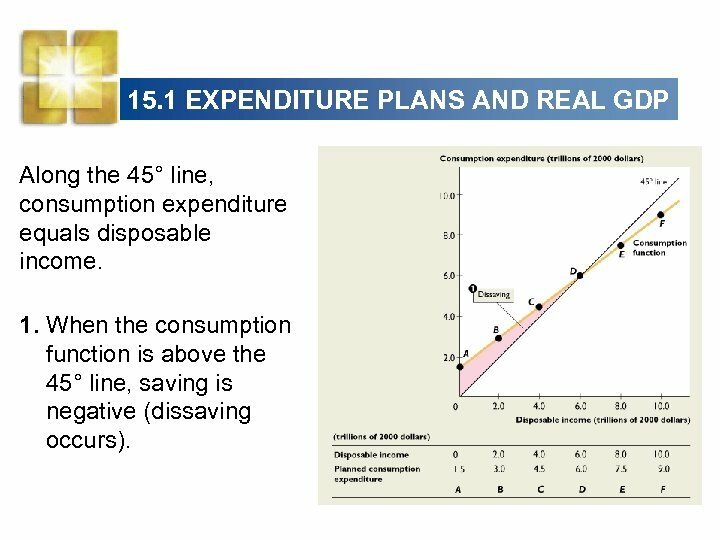 When the consumption function is above the 45° line, saving is negative (dissaving occurs). 15. 1 EXPENDITURE PLANS AND REAL GDP 2. When the consumption function is below the 45° line, saving is positive. 3. 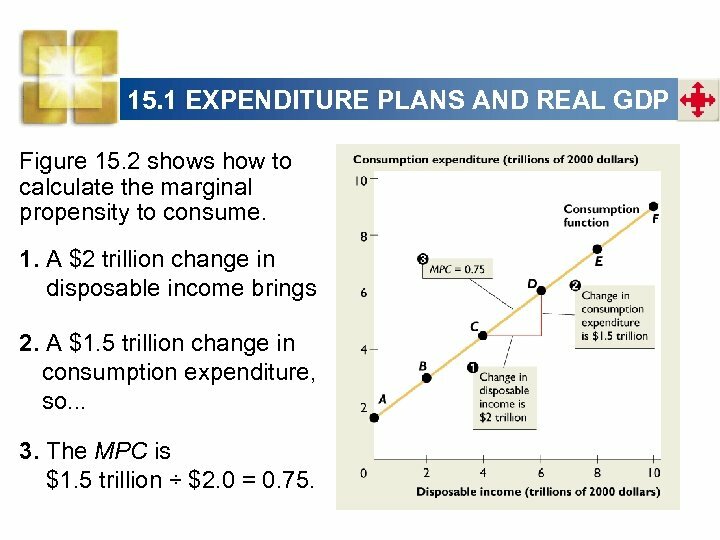 At the point where the consumption function intersects the 45° line, all disposable income is consumed and saving is zero. 15. 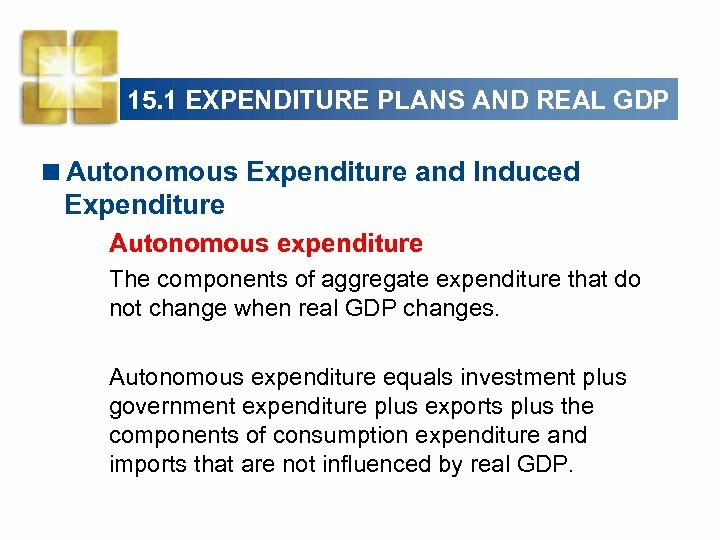 1 EXPENDITURE PLANS AND REAL GDP Figure 15. 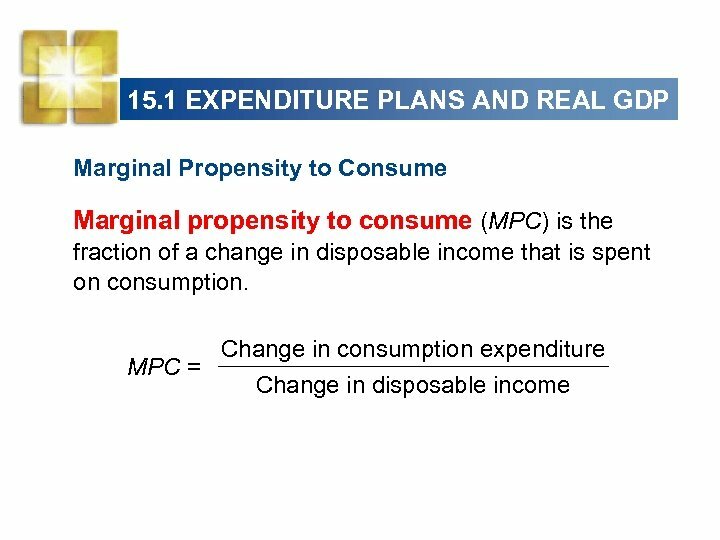 2 shows how to calculate the marginal propensity to consume. 1. A $2 trillion change in disposable income brings 2. A $1. 5 trillion change in consumption expenditure, so. . . 3. The MPC is $1. 5 trillion ÷ $2. 0 = 0. 75. 15. 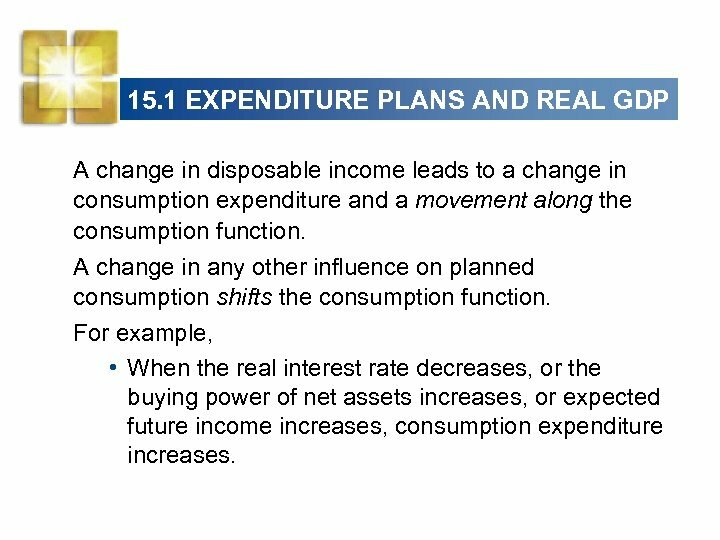 1 EXPENDITURE PLANS AND REAL GDP A change in disposable income leads to a change in consumption expenditure and a movement along the consumption function. A change in any other influence on planned consumption shifts the consumption function. 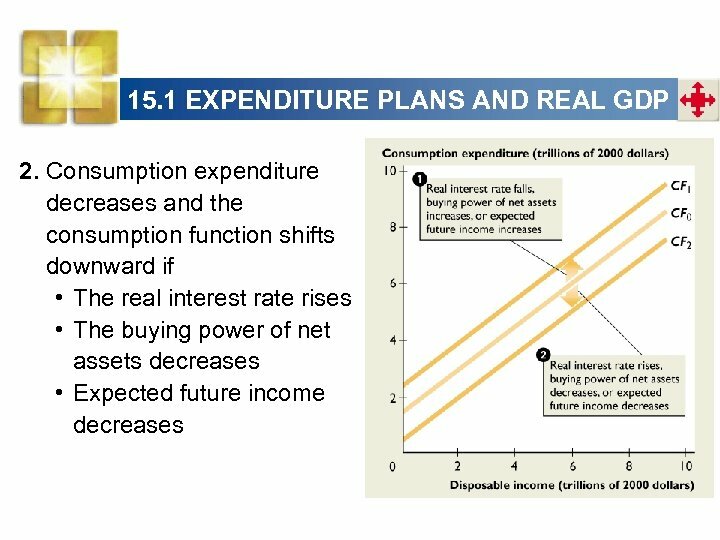 For example, • When the real interest rate decreases, or the buying power of net assets increases, or expected future income increases, consumption expenditure increases. 15. 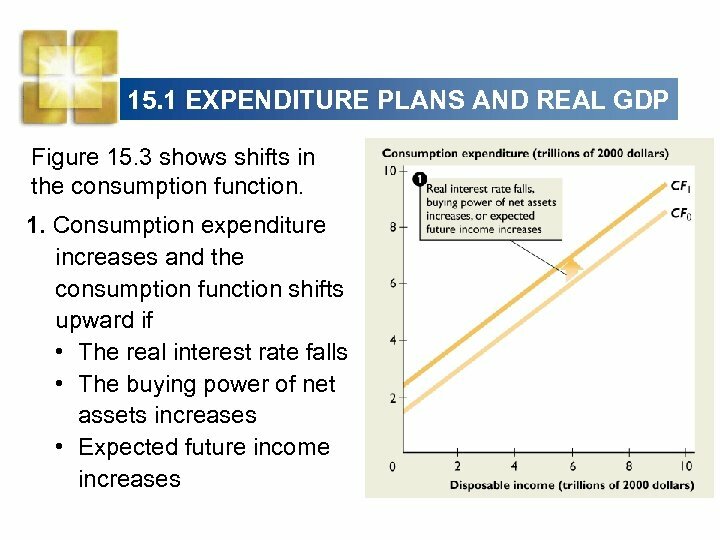 1 EXPENDITURE PLANS AND REAL GDP • When the real interest rate increases, or the buying power of net assets decreases, or expected future income decreases, consumption expenditure decreases. 15. 1 EXPENDITURE PLANS AND REAL GDP Imports and GDP Consumption expenditure is one major component of induced expenditure, imports are the other. In the short run, the factor influencing imports is U. S. real GDP. Marginal propensity to import is the fraction of an increase in real GDP that is spent on imports. The marginal propensity to import equals the change in imports divided by the change in real GDP that brought it about. 15. 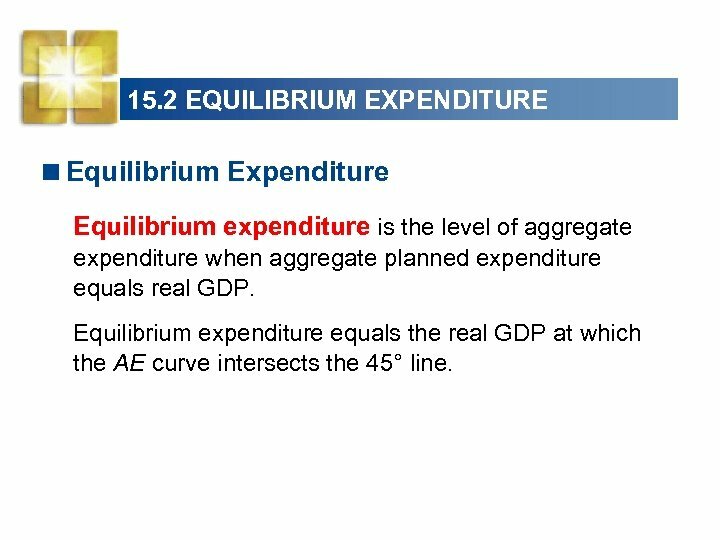 2 EQUILIBRIUM EXPENDITURE Figure 15. 4 shows the AE curve. Aggregate expenditure is the sum of Investment (I), Government expenditure (G), Exports (X), Consumption expenditure (C) minus Imports (M). 15. 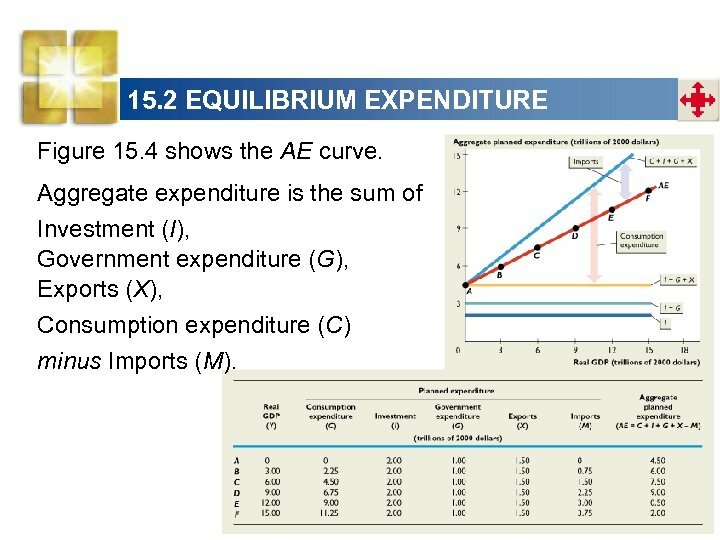 2 EQUILIBRIUM EXPENDITURE Figure 15. 5 shows equilibrium expenditure. 1. When aggregate planned expenditure exceeds real GDP, an unplanned decrease in inventories occurs. 2. When aggregate planned expenditure is less than real GDP, an unplanned increase in inventories occurs. 15. 2 EQUILIBRIUM EXPENDITURE 3. 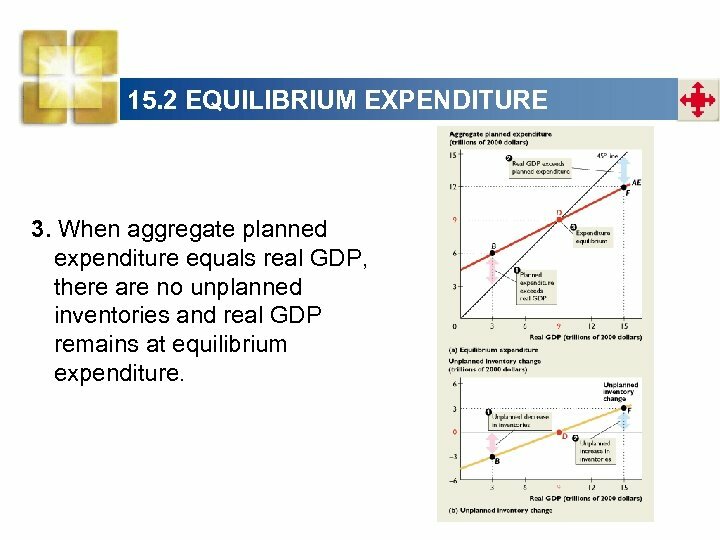 When aggregate planned expenditure equals real GDP, there are no unplanned inventories and real GDP remains at equilibrium expenditure. 15. 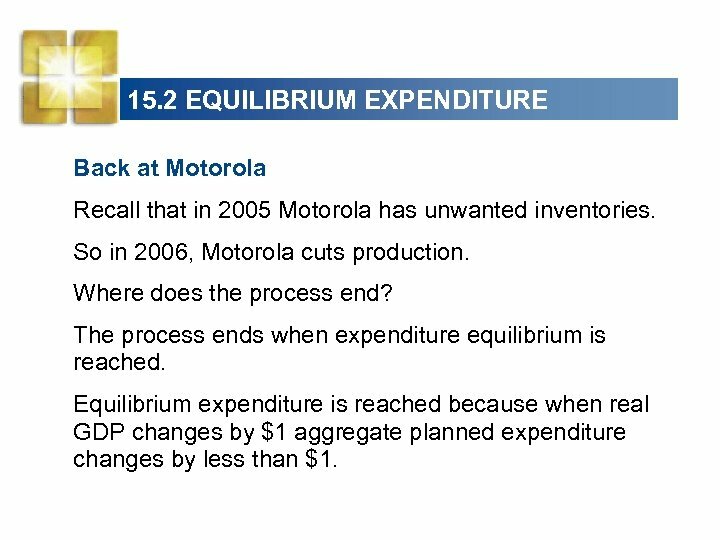 2 EQUILIBRIUM EXPENDITURE Back at Motorola Recall that in 2005 Motorola has unwanted inventories. So in 2006, Motorola cuts production. Where does the process end? The process ends when expenditure equilibrium is reached. 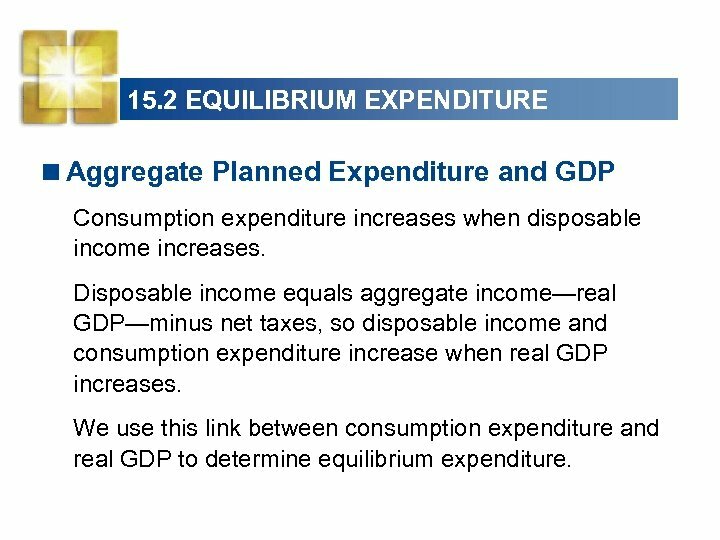 Equilibrium expenditure is reached because when real GDP changes by $1 aggregate planned expenditure changes by less than $1. 15. 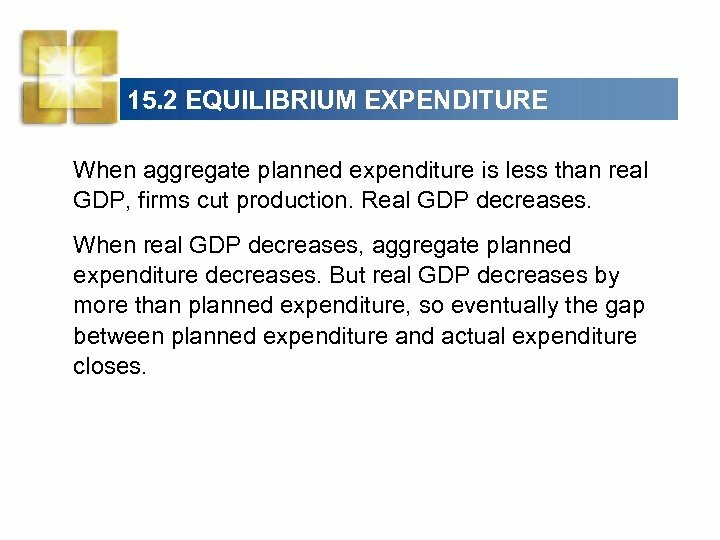 2 EQUILIBRIUM EXPENDITURE When aggregate planned expenditure is less than real GDP, firms cut production. Real GDP decreases. 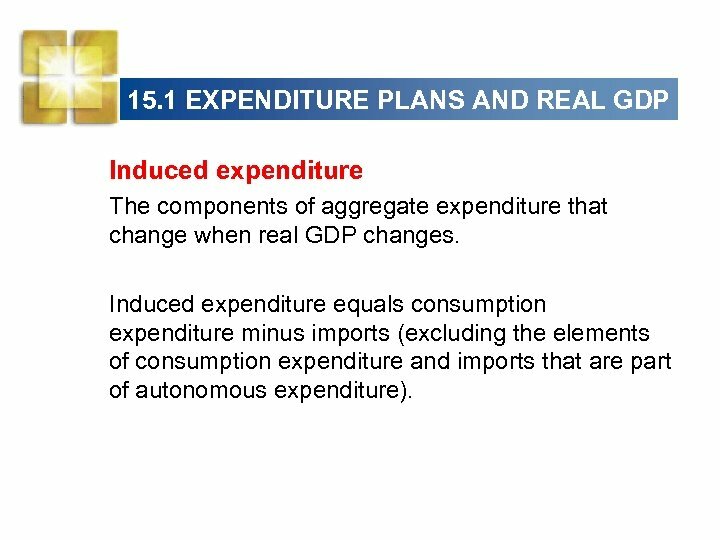 When real GDP decreases, aggregate planned expenditure decreases. But real GDP decreases by more than planned expenditure, so eventually the gap between planned expenditure and actual expenditure closes. 15. 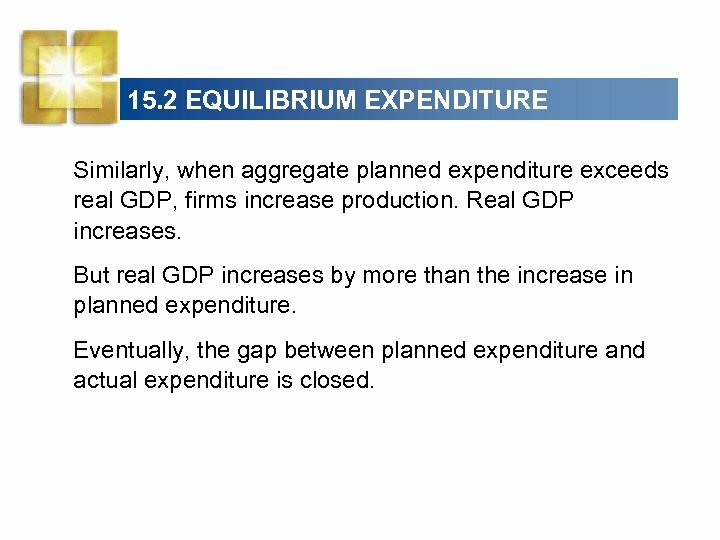 2 EQUILIBRIUM EXPENDITURE Similarly, when aggregate planned expenditure exceeds real GDP, firms increase production. Real GDP increases. But real GDP increases by more than the increase in planned expenditure. Eventually, the gap between planned expenditure and actual expenditure is closed. 15. 3 THE EXPENDITURE MULTIPLIER When investment increases, aggregate expenditure and real GDP also increase. But the increase in real GDP is larger than the increase in investment. 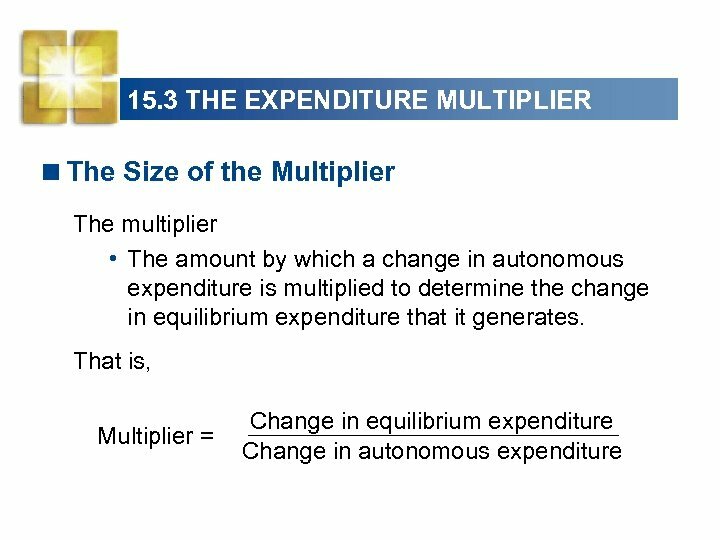 The multiplier is the amount by which a change in any component of autonomous expenditure is magnified or multiplied to determine the change that it generates in equilibrium expenditure and real GDP. 15. 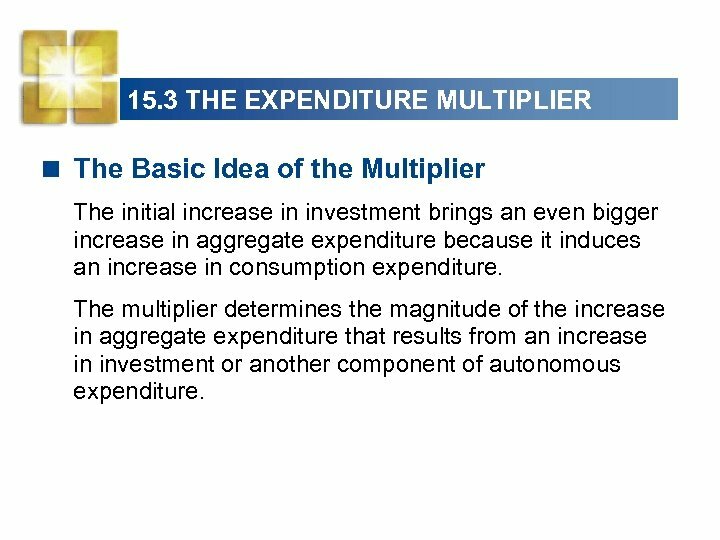 3 THE EXPENDITURE MULTIPLIER < The Basic Idea of the Multiplier The initial increase in investment brings an even bigger increase in aggregate expenditure because it induces an increase in consumption expenditure. 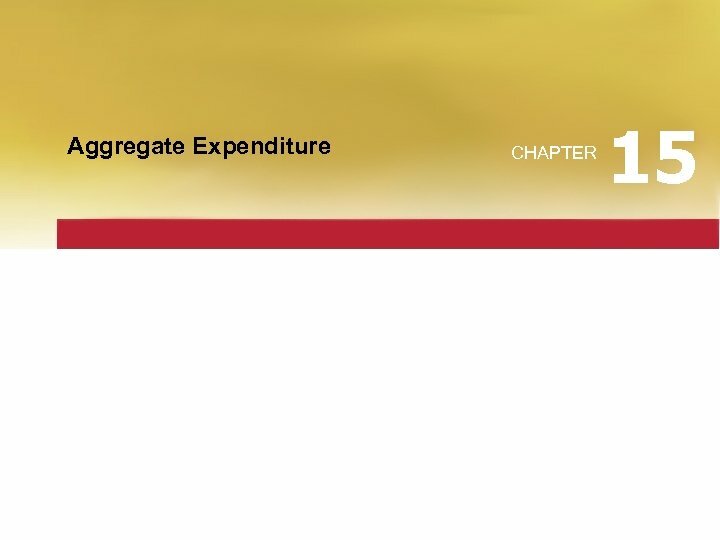 The multiplier determines the magnitude of the increase in aggregate expenditure that results from an increase in investment or another component of autonomous expenditure. 15. 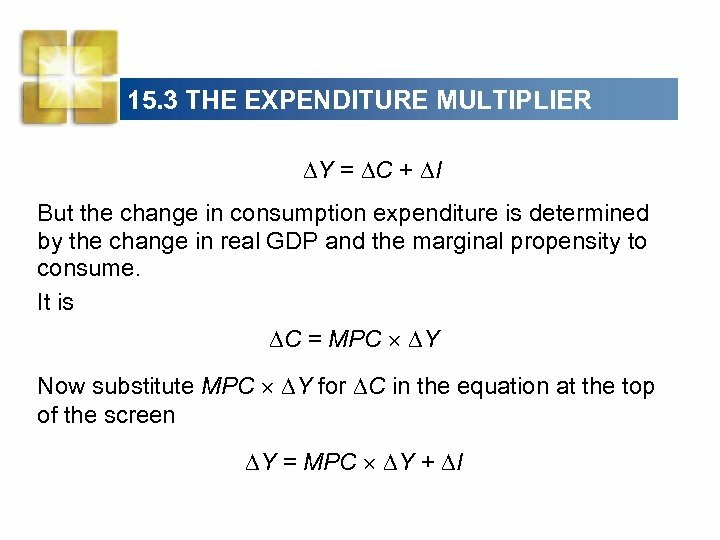 3 THE EXPENDITURE MULTIPLIER Figure 15. 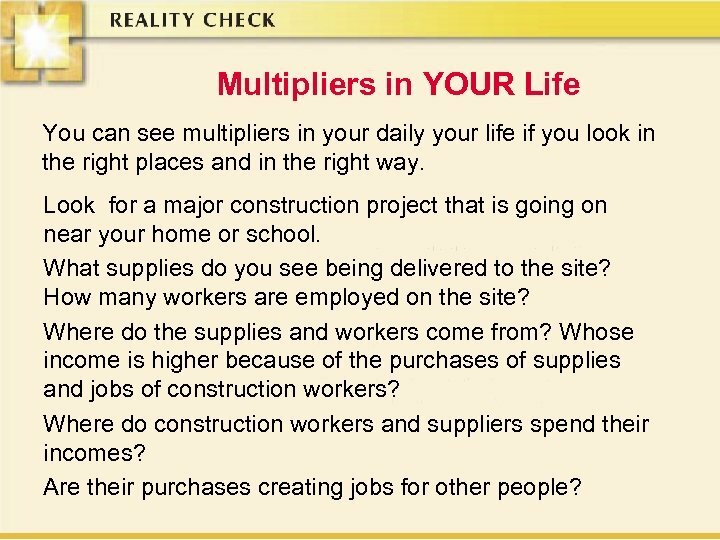 6 illustrates the multiplier. 1. A $0. 5 trillion increase in investment shifts the AE curve upward by $0. 5 trillion from AE 0 to AE 1. 2. Equilibrium expenditure increases by $2 trillion from $9 trillion to $11 trillion. 3. 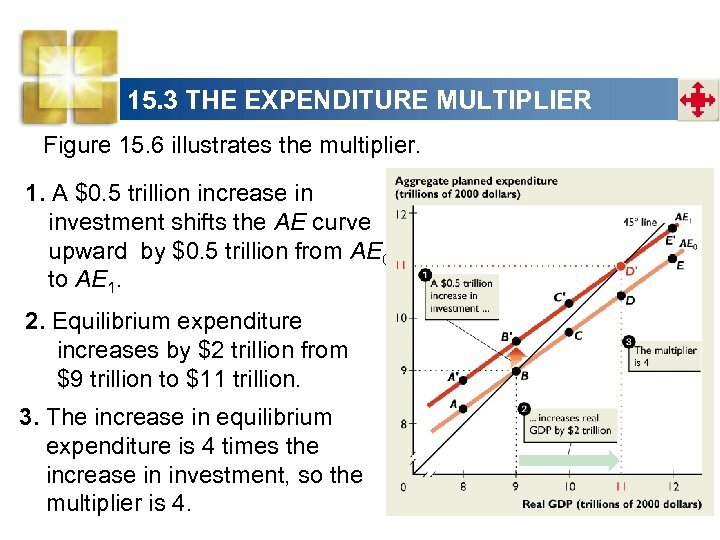 The increase in equilibrium expenditure is 4 times the increase in investment, so the multiplier is 4. 15. 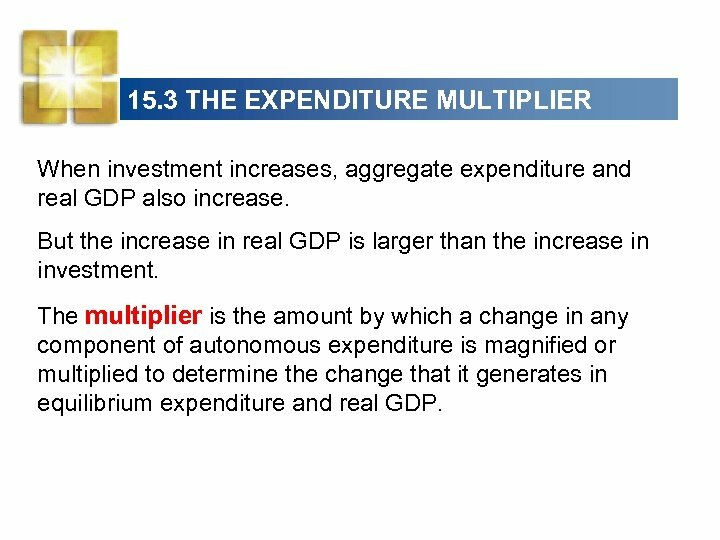 3 THE EXPENDITURE MULTIPLIER Why Is the Multiplier Greater Than 1? 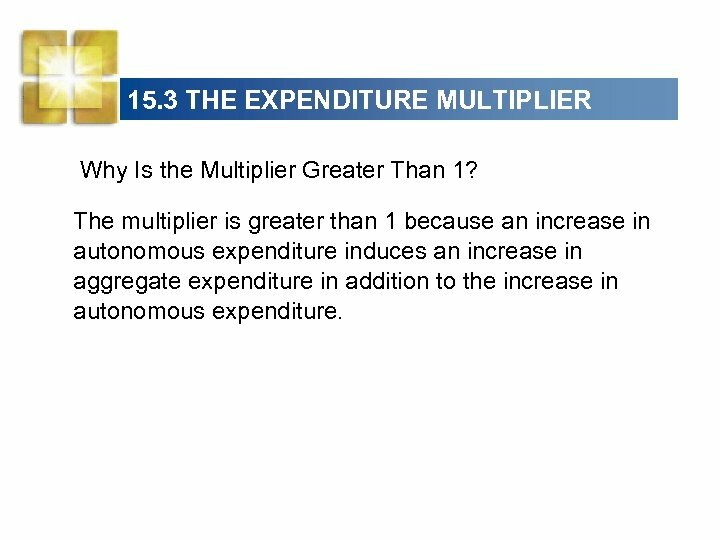 The multiplier is greater than 1 because an increase in autonomous expenditure induces an increase in aggregate expenditure in addition to the increase in autonomous expenditure. 15. 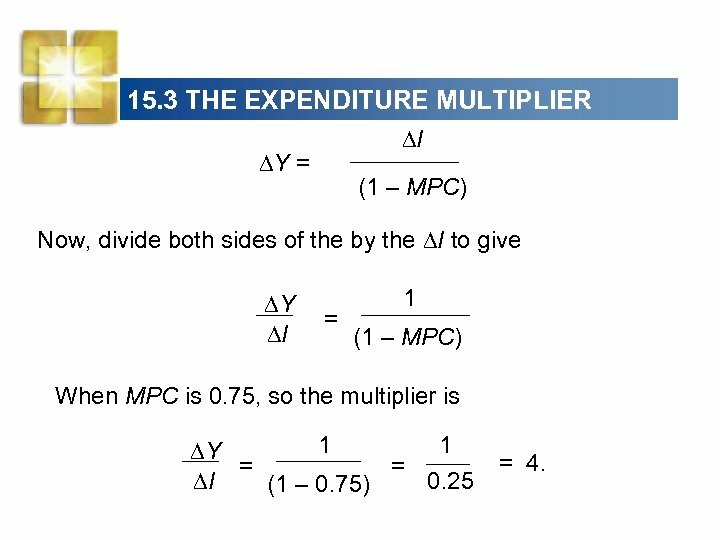 3 THE EXPENDITURE MULTIPLIER I Y = (1 – MPC) Now, divide both sides of the by the I to give Y I = 1 (1 – MPC) When MPC is 0. 75, so the multiplier is 1 1 Y = = I 0. 25 (1 – 0. 75) = 4. 15. 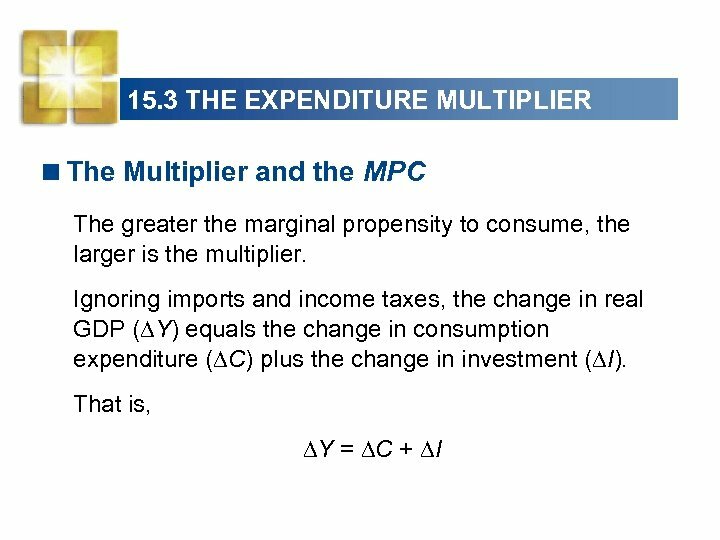 3 THE EXPENDITURE MULTIPLIER < The Multiplier, Imports, and Income Taxes The size of the multiplier depends not only on consumption decisions but also on imports and income taxes. 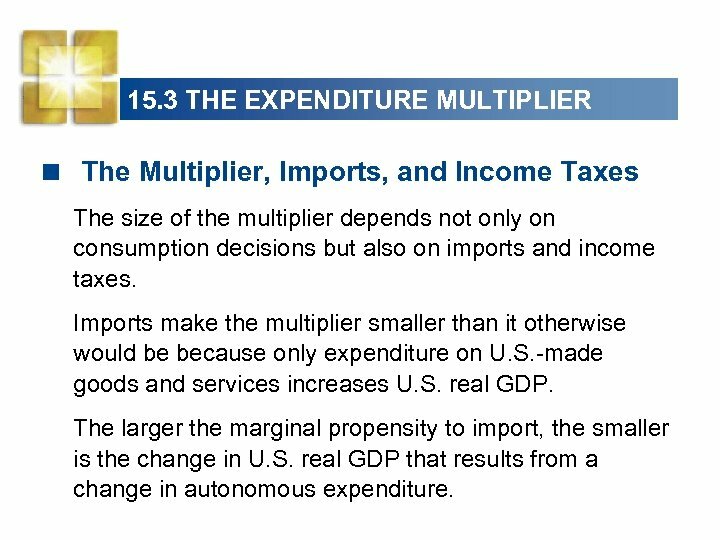 Imports make the multiplier smaller than it otherwise would be because only expenditure on U. S. -made goods and services increases U. S. real GDP. 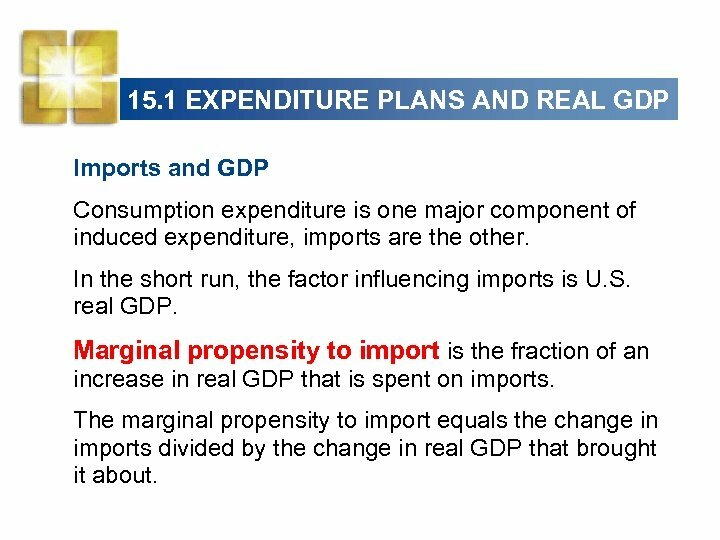 The larger the marginal propensity to import, the smaller is the change in U. S. real GDP that results from a change in autonomous expenditure. 15. 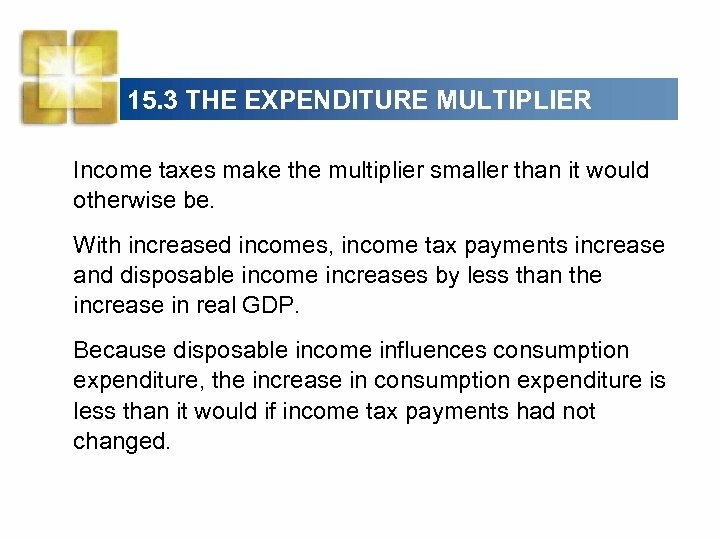 3 THE EXPENDITURE MULTIPLIER Income taxes make the multiplier smaller than it would otherwise be. With increased incomes, income tax payments increase and disposable income increases by less than the increase in real GDP. Because disposable income influences consumption expenditure, the increase in consumption expenditure is less than it would if income tax payments had not changed. 15. 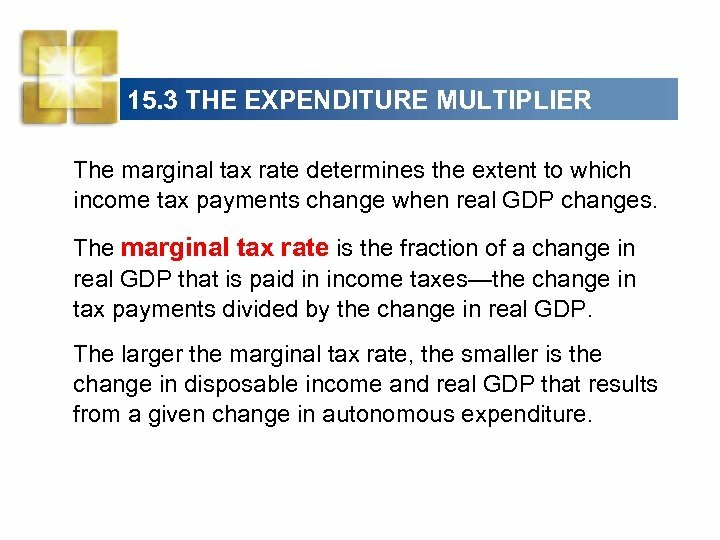 3 THE EXPENDITURE MULTIPLIER The marginal tax rate determines the extent to which income tax payments change when real GDP changes. The marginal tax rate is the fraction of a change in real GDP that is paid in income taxes—the change in tax payments divided by the change in real GDP. The larger the marginal tax rate, the smaller is the change in disposable income and real GDP that results from a given change in autonomous expenditure. 15. 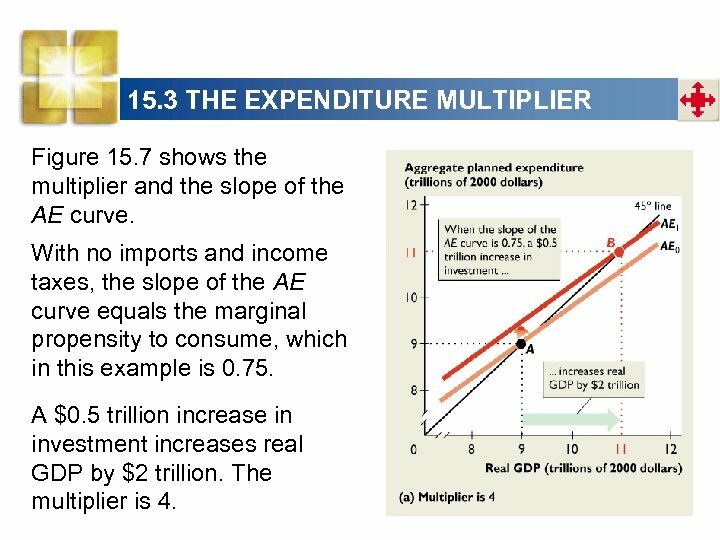 3 THE EXPENDITURE MULTIPLIER Figure 15. 7 shows the multiplier and the slope of the AE curve. 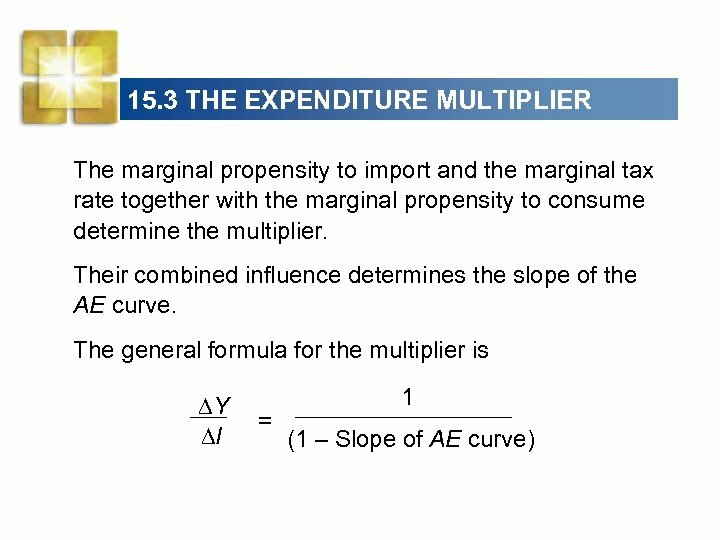 With no imports and income taxes, the slope of the AE curve equals the marginal propensity to consume, which in this example is 0. 75. A $0. 5 trillion increase in investment increases real GDP by $2 trillion. The multiplier is 4. 15. 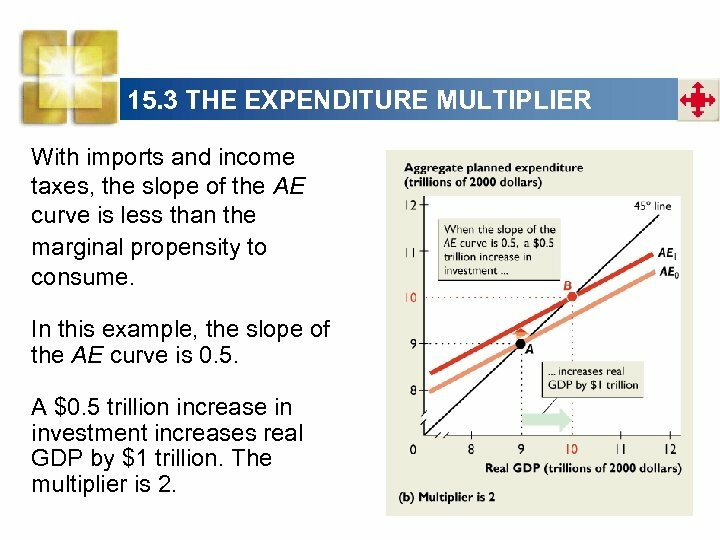 3 THE EXPENDITURE MULTIPLIER With imports and income taxes, the slope of the AE curve is less than the marginal propensity to consume. In this example, the slope of the AE curve is 0. 5. A $0. 5 trillion increase in investment increases real GDP by $1 trillion. The multiplier is 2. 15. 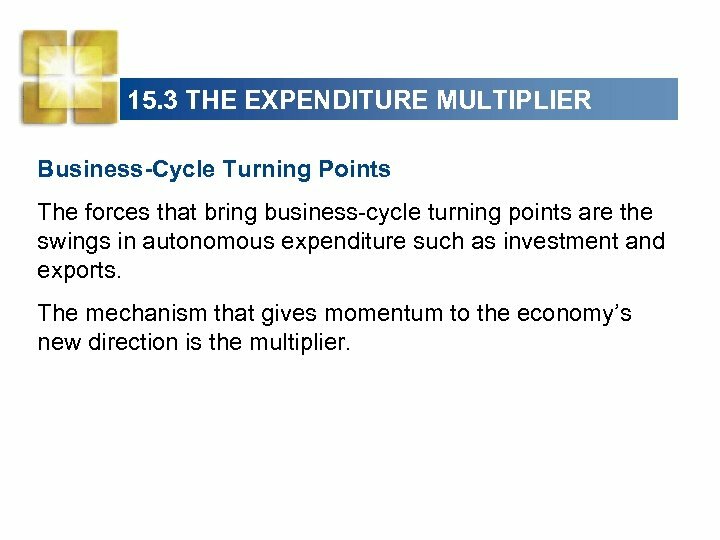 3 THE EXPENDITURE MULTIPLIER Business-Cycle Turning Points The forces that bring business-cycle turning points are the swings in autonomous expenditure such as investment and exports. The mechanism that gives momentum to the economy’s new direction is the multiplier. 15. 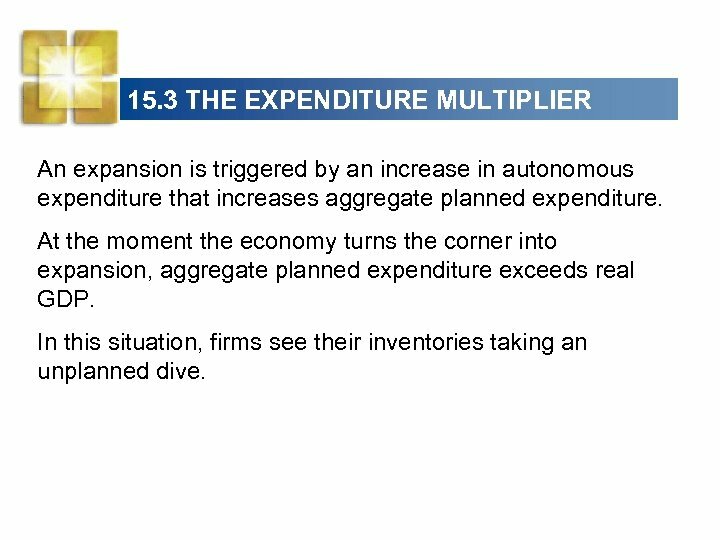 3 THE EXPENDITURE MULTIPLIER An expansion is triggered by an increase in autonomous expenditure that increases aggregate planned expenditure. At the moment the economy turns the corner into expansion, aggregate planned expenditure exceeds real GDP. In this situation, firms see their inventories taking an unplanned dive. 15. 3 THE EXPENDITURE MULTIPLIER The expansion now begins. To meet their inventory targets, firms increase production, and real GDP begins to increase. This initial increase in real GDP brings higher incomes, which stimulate consumption expenditure. 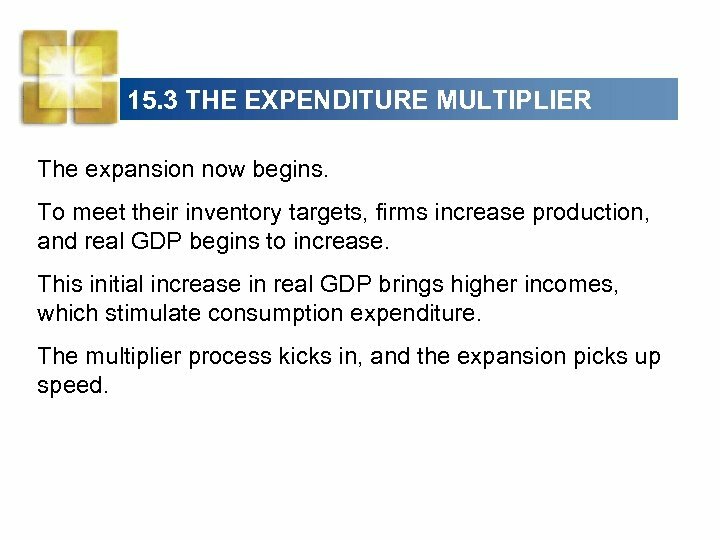 The multiplier process kicks in, and the expansion picks up speed. 15. 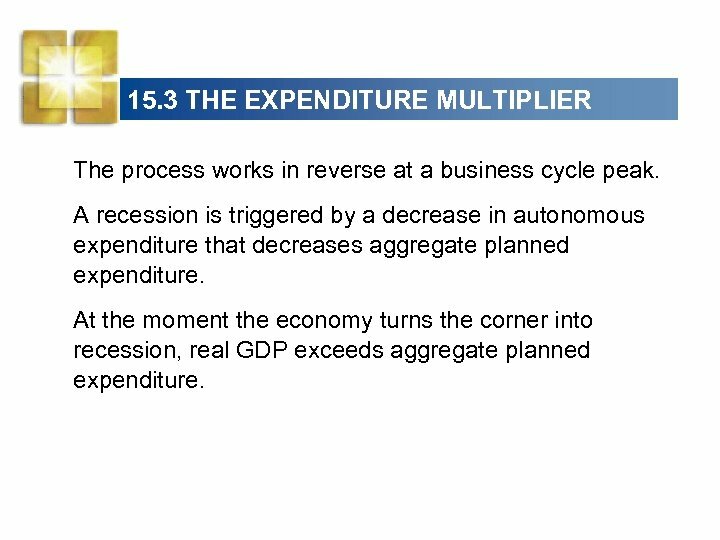 3 THE EXPENDITURE MULTIPLIER The process works in reverse at a business cycle peak. A recession is triggered by a decrease in autonomous expenditure that decreases aggregate planned expenditure. At the moment the economy turns the corner into recession, real GDP exceeds aggregate planned expenditure. 15. 3 THE EXPENDITURE MULTIPLIER In this situation, firms see unplanned inventories piling up. The recession now begins. To reduce their inventories, firms cut production, and real GDP begins to decrease. This initial decrease in real GDP brings lower incomes, which cut consumption expenditure. 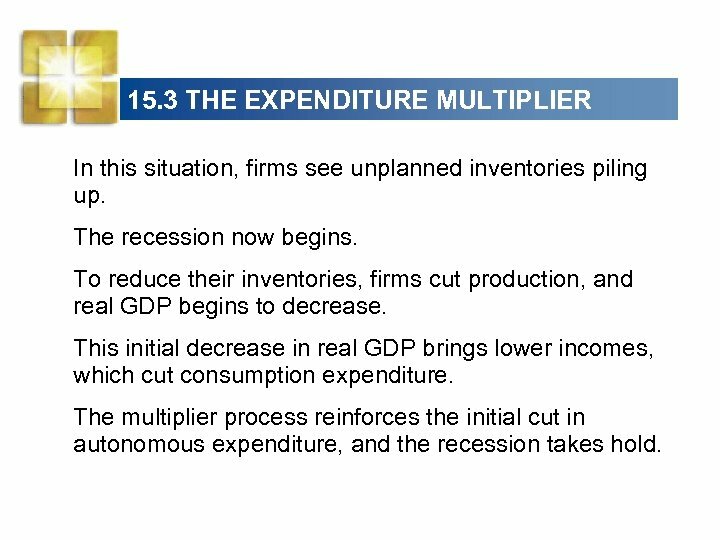 The multiplier process reinforces the initial cut in autonomous expenditure, and the recession takes hold. 15. 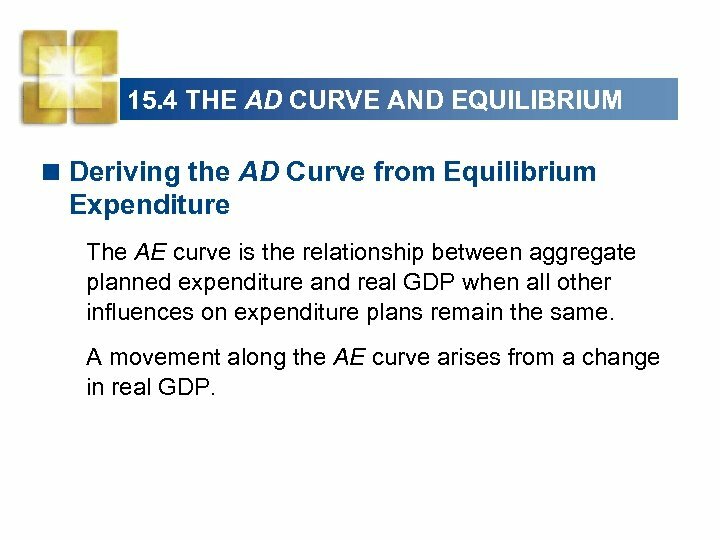 4 THE AD CURVE AND EQUILIBRIUM < Deriving the AD Curve from Equilibrium Expenditure The AE curve is the relationship between aggregate planned expenditure and real GDP when all other influences on expenditure plans remain the same. A movement along the AE curve arises from a change in real GDP. 15. 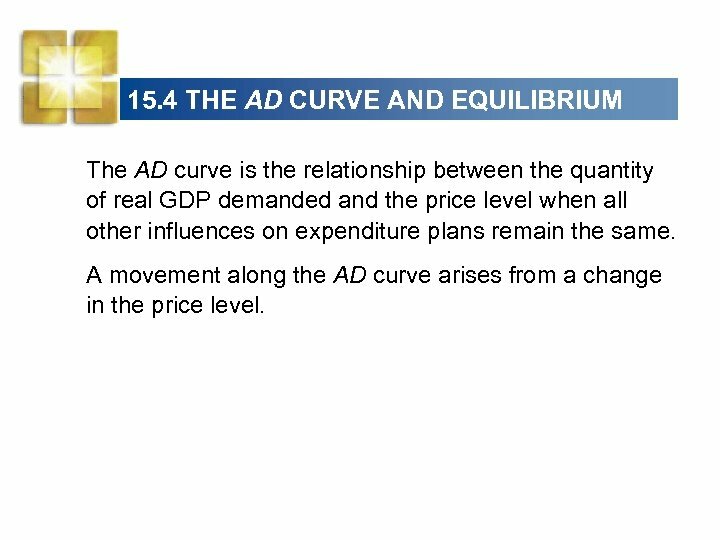 4 THE AD CURVE AND EQUILIBRIUM The AD curve is the relationship between the quantity of real GDP demanded and the price level when all other influences on expenditure plans remain the same. A movement along the AD curve arises from a change in the price level. 15. 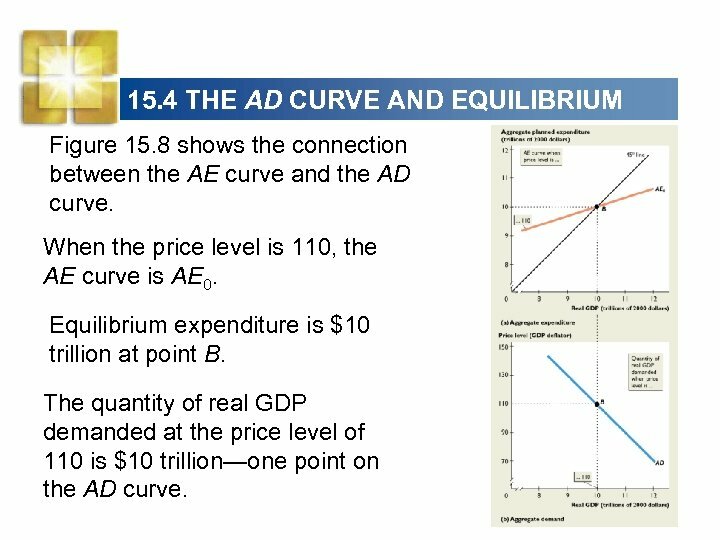 4 THE AD CURVE AND EQUILIBRIUM Equilibrium expenditure depends on the price level. When the price level changes, other things remaining the same, aggregate planned expenditure changes and equilibrium expenditure changes. Aggregate planned expenditure changes because a change in the price level changes the buying power of net assets, the real interest rate, and the real prices of exports and imports. So when the price level changes, the AE curve shifts. 15. 4 THE AD CURVE AND EQUILIBRIUM Figure 15. 8 shows the connection between the AE curve and the AD curve. When the price level is 110, the AE curve is AE 0. 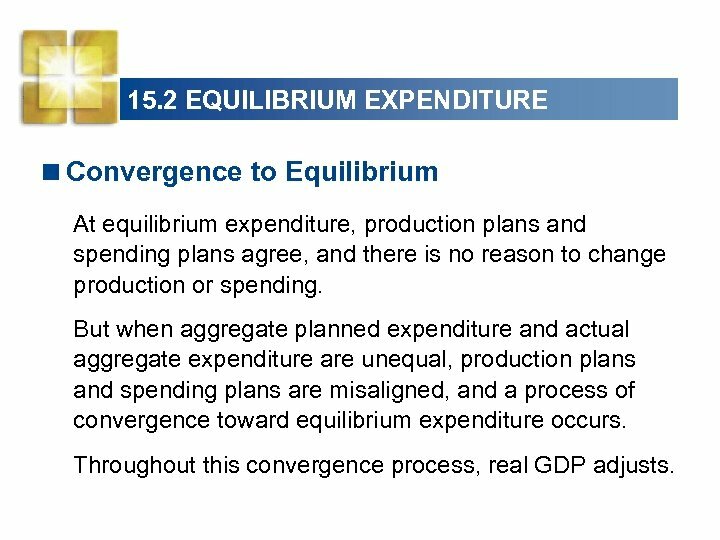 Equilibrium expenditure is $10 trillion at point B. The quantity of real GDP demanded at the price level of 110 is $10 trillion—one point on the AD curve. 15. 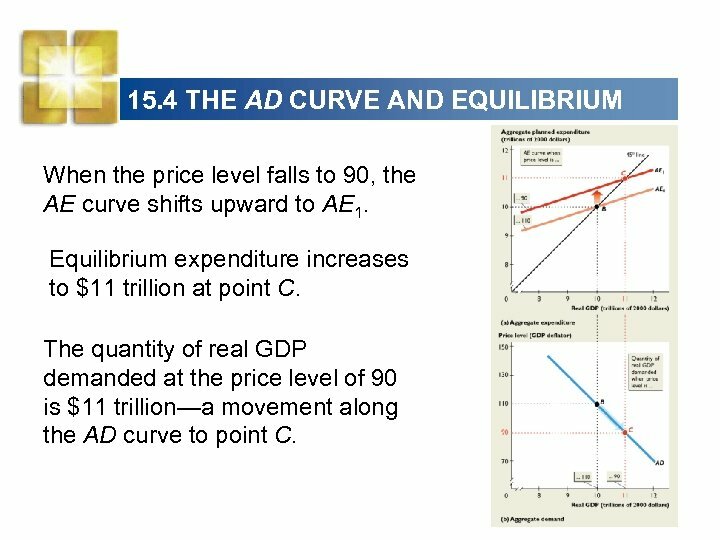 4 THE AD CURVE AND EQUILIBRIUM When the price level falls to 90, the AE curve shifts upward to AE 1. Equilibrium expenditure increases to $11 trillion at point C. The quantity of real GDP demanded at the price level of 90 is $11 trillion—a movement along the AD curve to point C.
15. 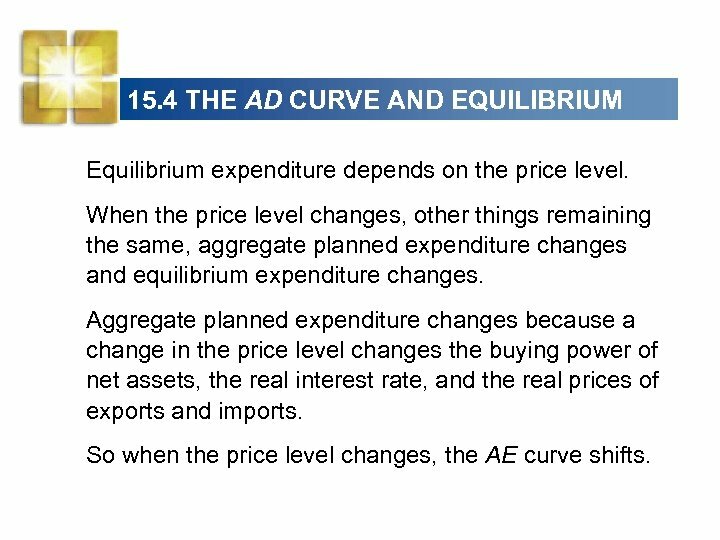 4 THE AD CURVE AND EQUILIBRIUM When the price level rises to 130, the AE curve shifts downward to AE 2. Equilibrium expenditure decreases to $9 trillion at point A. The quantity of real GDP demanded at the price level of 130 is $9 trillion—a movement along the AD curve to point A.
Multipliers in YOUR Life You can see multipliers in your daily your life if you look in the right places and in the right way. Look for a major construction project that is going on near your home or school. What supplies do you see being delivered to the site? How many workers are employed on the site? Where do the supplies and workers come from? Whose income is higher because of the purchases of supplies and jobs of construction workers? Where do construction workers and suppliers spend their incomes? Are their purchases creating jobs for other people?